Not really a Blonde Ale, not a Pale Ale, not an IPA. 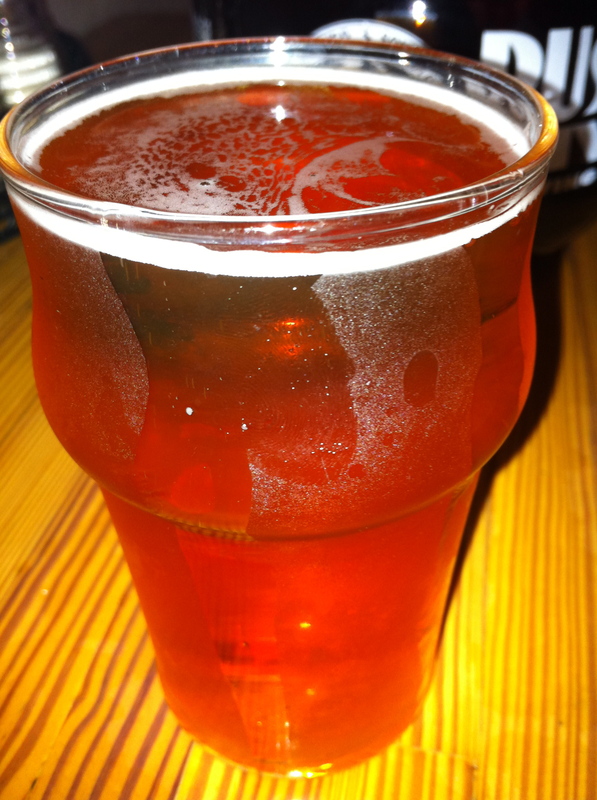 Happy Hops is a light colored refreshing ale with a pronouced hop character. You may also see a special version of this beer once a year called Happy Hops Harvest, which is brewed with fresh “wet” hops grown locally. I knew the minute I saw this beer that I had my the right choice. It’s light caramel in color with peach highlights appearing when the light hits it just right. Carbonation is present, but never seems to make to the whips of foam the tops the beer. Hops were HEAVY in the nose and boy was I surprised. Big juicy pine notes flooded my nostrils with the each sniff. Hints of citrus and sweet are there, but buried. The people at Russian River might not know what to call this style, but I was certain that it was a pale ale. The taste of this beer is amazing! Think liquid sugar daddy candy, but without all the cavity-inducing sugar. As it mellows out the hops become more pronounced, but reserve themselves for the backend to keep things balanced. This is a surprisingly sweet, but well done pale ale. Mouthfeel is light to medium and oh, so smooth. The traditional “failings” of the pale ale are not presence (drying, stickiness), except for a faint hint of hop juice at the end. I was surprised by this beer, but in a good way. The nose said hop bomb all the way, but the taste was as balanced as balanced can be. I really think Russian River has a real winner on their hands and I hope that they start bottling this soon.